Jake Arrieta extended his record Wrigley Field scoreless streak after he threw eight shutout innings and the Cubs got back on track Saturday with a 6-2 win against the Rockies. Arrieta has now gone 48 2/3 innings without giving up a run at home. The last time a team scored against him at Wrigley Field was on July 25, 2015, vs. the Phillies. "We played some good defense, hit some homers, but it's always about the starting pitching on a day like that," Cubs manager Joe Maddon said. "Jake permitted all that to happen. He permitted us to add on toward the end of the game more comfortably. He was again outstanding today." The Cubs' victory came after an ugly 6-1 loss to the Rockies in Friday's series opener, when the North Siders made four errors and put up their lowest run total of the season. Saturday, the Rockies threatened in the third inning when Dustin Garneau led off with a double and reached third with one out. But Arrieta escaped that inning by striking out Trevor Storyswinging, and the Rockies only got one runner in scoring position against him for the rest of the game. 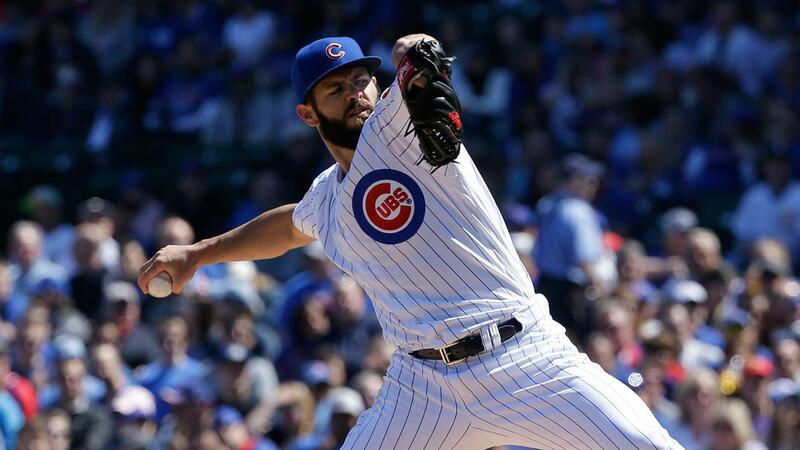 "His fastball was explosive right out of the gate," Rockies manager Walt Weiss said of Arrieta. "When he's commanding all his stuff, it's going to be tough." Carlos Gonzalez, who extended his career-best hit streak to 21 games on a fourth-inning single, hit his fourth homer this season -- a two-run shot off Travis Wood in the ninth. Gonzalez also made an impressive catch when he crashed into the wall to rob David Rossin the third. Rockies starter Christian Bergman struck out a career-high seven in five innings, butAnthony Rizzo and Jorge Soler's back-to-back home runs on first-pitch curveballs put a damper on his day, ended a three-game win streak and helped set up a Sunday rubber match in Chicago. "I gave the team a chance to win and kept it close against a guy who you know runs are going to be at a premium," Bergman said. "Obviously, I'd have liked to have located some pitches a little differently. That's why he doesn't give up runs: Garneau doubled to open the third against Arrieta and took third on Bergman's grounder to second. It was time for the Rockies to somehow lift a hit or even a deep-enough fly ball into the outfield to end Arrieta's streak. All Cristhian Adamescould muster was a grounder to Rizzo at first, and Story ended up with one of his three strikeouts. Can't stop Dexter: Dexter Fowler padded the Cubs' lead with a three-run homer to right field in the seventh inning. Fowler, who also walked in the third inning, has reached base in every game this season and has gotten aboard 26 times in 47 plate appearances this year. "[Arrieta] is our horse," Fowler said. "... Any time you can put some runs up with Jake pitching, it's definitely a plus." The Cubs have also won Arrieta's past 16 regular-season starts, the longest streak in Cubs history since at least 1913. Rockies third baseman Nolan Arenado no doubt would have picked an easier way to celebrate his 25th birthday than facing Arrieta on an 0-for-4 day. Still, his three Rawlings Gold Glove Awards and his 42-homer performance last season are evidence that he's one of the game's top young stars, and he's not yet peaked. "I don't know if it's possible, but history in this game tells us 25 is not your prime yet," Weiss said. "Those are years before your prime in this game. So that's exciting to think about. This guy is one of the best in all the game. I don't know how much better you can get, but I know you never stop trying to get better. That's Nolan's mentality." Rockies: Right-hander Tyler Chatwood (1-1, 4.38 ERA), who pitched decently in his last game but lost to the Giants when bitten by a pair of two-out homers, will make his first career appearance at Wrigley Field on Saturday at 12:20 p.m. MT. Cubs: Left-hander Jon Lester (1-0, 2.77 ERA) will make his third career regular-season start against the Rockies on Saturday at 1:20 p.m. CT. Lester, who is coming off a no-decision, also won Game 4 of the 2007 World Series against the Rockies at Coors Field.